Fishing is one of the most relaxing activities that allow you to spend some quality time with your family in a more laid-back manner. For seasoned anglers, the venue, weather and the time to fish are the most important factors that will determine the success of your fishing activity. While all three elements are essential, choosing a location where fish is likely to be present shouldn’t be set aside. 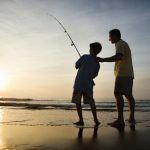 If you’re fishing with kids, they can quickly get bored when it takes hours for you to get a good catch. So here are some careful considerations when choosing the best spot for fishing. For seasoned anglers, the swell, waves, and tides are indicators of what the weather will be for that day. The waves often come in sets, and some waves are much bigger than the previous ones. These waves have a dramatic impact on your fishing results. As fish thrive on the sea’s movement, you should be aware of the state of the tide. They are going to influence the marine environment. The fish are aware of the conditions where they can get food easiest. Near high tide is considered a good time for fishing in most cases. It isn’t all the time that you’ll see visible signs of these marine creatures. There are certain weather conditions that fish favors like strong tides and rough weather. The power of tide is useful for the fish as they utilize it for traveling. You can also observe that they are most active when there are strong tides. The first thing that you need to check when searching for a good fishing spot is the color of the water. If you see a strong surf or swell, it will be evident in the color of the water. If the sea is clear, it means that there’s a slight chance that the fish will get close to the shore. Due to the presence of the sunlight, fish won’t venture inshore as they are visible to predators (and prey). You might also want to check if there are fishless spots and hot spots. There are seas where fish is uncommon. You can waste time waiting for the fish to bite the bait when in fact, that spot is fishless. Take time to search for the type of species that love swell and surf. These are the ones that you’ll catch a glimpse of, especially on colored and rough water. Make use of your Internet access at home to find a tide table. It’s best to read it before you plan your fishing trip. If you prefer to fish in the surf, you need to be aware of the wave’s movements. If waves are moving the sand, which is evident when there are patches of brown water, this is the spot where fish will hunt for food. It’s worth observing this movement and pattern. You can spend a rewarding fishing trip with your family if you know where to look for the best fishing spots. Take time to research marine environmental factors and learn some tips and tricks for fishing activity to be memorable.